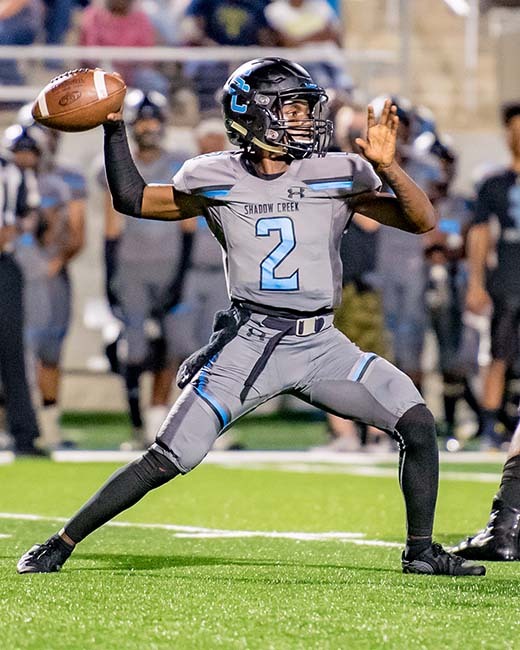 OFFENSIVE LEADER - Shadow Creek quarterback Jamarian George has been the offensive field general for the Sharks as they improved to 12-0 after beating Cedar Park 21-14 to advance to the 5A Region III Div. I semifinals. George was 15-of-28 passing for 192 yards and two TDs. PEARLAND SHADOW CREEK— The game between Shadow Creek and Cedar Park could have been like watching paint dry as there were over 20 punts in the game with a few scores in between. "We knew this was going to be a really tough test for us," Shadow Creek head coach Brad Butler said. "Defensively I thought we really played tough and they hung in there and made some plays." That's when the punt exchanges began and the game was filled with penalties and misguided passes from both teams. But it didn't take long as Shadow Creek quickly scored following the kickoff as George fired a long pass to C.J. Guidry who hauled in the ball for a 49-yard touchdown pass to retake the lead 21-14 with 5:26 left in the contest. "When we've got our back against the wall we've been able to respond," Butler said. "We'd love to come out here and not have to answer so many times but I'm proud of them that they just continue to fight. Really excited to be 12-0." The Sharks defense stepped up and forced Cedar Park to turn over the ball on downs at their own 31 and the Shadow Creek offense was able to run out the clock a punch the Sharks' ticket to the third round.